IndonesiaTravelVisit.com | The sound of splash water, the beauty of its ancient architecture, and its wonderful view make Taman Sari becomes very enchanting. Its alleys and buildings make Taman Sari has many secrets to reveal. An era after Giyanti Treaty, Pangeran Mangkubumi was build a palace as the central of Kasultanan Ngayogyakarta Hadiningrat's goverment. Pangeran Mangkubumi later known as Sultan Hamengku Buwono I was building the palace in the center of imaginary line connecting Parangtritis Beach and Mount Merapi. The point that was being a reference for building the palace is an umbul (fountain). To respect his wives good turns because they helped Sultan in the war time, Sultan asked Demak Tegis, a Portuegese architect and Bupati Madiun, as the foreman, to build a palace in that fountain which is located 500 meters in the south of keraton. The palace which is surrounded by Segaran (artificial lake) with the fragrant scent of flowers which were planted in the artificial island surrounds it is called as Taman Sari (Water Castle) now. "On this Gapura Panggung, Sultan usually watched the dance down there. The buildings in its side was the place for people to play their instruments and in the middle usually small stage which is used by the dancers to show their versed and elegant dance," the guide explains to IndonesiaTravelVisit.com as we enter Taman Sari. From Gapura Panggung, the guide brings IndonesiaTravelVisit.com to enter the area which was only Sultan and his family could enter, Taman Sari pools. The sound of splash water immediately greets us. The water limpidity blends nicely with the stout light-yellow walls. The pools is divided into three, Umbul Kawitan (pool for the prince and the princess), Umbul Pamuncar (pool for Sultan's mistress), and Umbul Panguras (Sultan's pool). A stoneware which was used for Sultan wives to reflect themselves still intactly stands when IndonesiaTravelVisit.com enter the tower of Sultan's private room. Ornaments which used to beautify the stoneware give a glamour effect to all things that were placed beside the Sultan's wardrobe. Imagine, 200 years ago there was a woman was waiting water in the stoneware until its calm then she down her head, fixed her makeup and bun, beautify her body while reflecting herself in the water mirror. 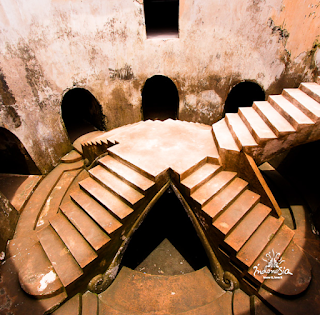 Besides the stoneware and Sultan's private room, in this three floored tower we can find wooden stairs which are still taken care and it will gave effect of antique for everyone who sees it. Up to the top, the reflection of the sunshine form the pool down there and all Taman Sari area will be clearly seen. Long time ago from this place, Perhaps Sultan also enjoyed this view, and Taman Sari view which was still complete with its artificial lake and the flowers fragrant. After enjoying the view from the top of the tower, the guide brings IndonesiaTravelVisit.com into Gapura Agung, the arrival of Kereta Kencana which carried Sultan and his family. The gate which is dominated by flowers and bird's wings ornament is the entrance for Sultan and family to Taman Sari. 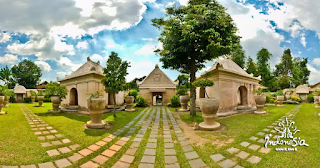 Place for meditation which is right at the south of Taman Sari becomes the next destination. Before going to the war, Sultan would meditate in this place. Silent and quiet atmosphere instantly felt when IndonesiaTravelVisit.com enters. In this place, Sultan would think all the posibilities to negotiate with the enemies and war strategies to make sovereignty of Keraton Yogyakarta keep in order. This area is also to be a storage for the weapons, armors, and purgatory place for antique keris. Its yard usually used by the Sultan's solders to war practice. IndonesiaTravelVisit.com parted with the guide in front of the Gapura Agung. But it does not mean that the journey will be enad because there are many places that must be visited, such as Sumur Gumuling and Kenongo Building. 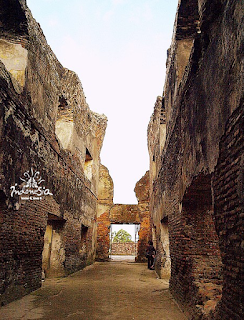 To reach those places, you should went through Tajug, wind way alley that was used to connect Taman Sari with Keraton and Pulo Kenongo. This wide underground alley is used as the place when Keraton in the critical condition. Many hidden places can be found in this place. Leaving Tajug, you can see traces of Pulo Kenongo which was formerly an artificial island that was planted by cananga flowers to give fragrant into Taman Sari. IndonesiaTravelVisit.com then goes to Sumur Gumuling, underground mosque as the place for Sultan and family to do their religious duty. This two-story building is designed to have a good acoustic side. So, when the imam led the prayer, her voice would be clearly hear from all over the length and breadth of the building. Now, it still can being felt. The people speech who are far away from us will feel like they are on our side. Moreover, we can go to the center of the mosque by pass through the dark alleys. Arriving in the square-shaped with 5 steps around it in the center of the mosque, the feeling of majesty instantly felt. When we look up, the blue sky will greet us. The sounds of bird that came from settlements in Taman Sari area will add the serene atmosphere. The last destination is Kenongo Building. The building which was used for Sultan to dine with family is the highest building in Taman Sari. In this place you can watch the enchanting golden sunset. All Taman Sari complez also can be seen from the top of Gedung Kenongo such as, Soko Guru mosquee in the east Taman Sari and Tajug's ventilations. Satisfied by the freshness of water in Taman Sary, the sky will greet us. The beautiful and enchanting view is offered by Taman Sari. 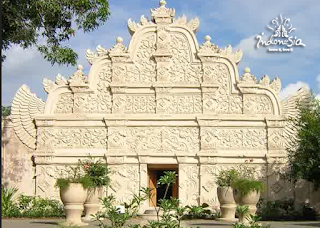 The Enchanting water pools blend with walls which was blended from European, Hinduism, Java and China styled become a value that makes Taman Sari unforgetable. 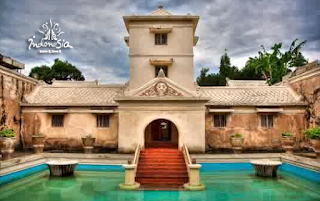 0 Komentar untuk "TAMAN SARI A Water Castle which is Full of Beauty and Secret"